Please excuse my upcoming language, buuttt….. Trying to organically take care of curly hair is a giant pain in the A$$!!! 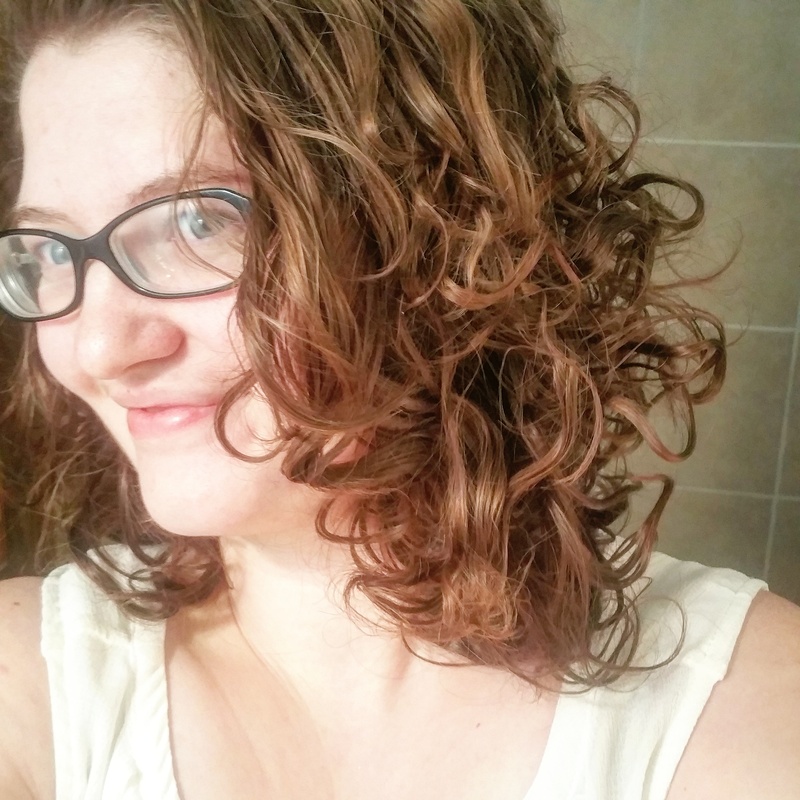 I have not found a single hair product anywhere for curly hair that does not have a few questionable ingredients. Lets take a look at some of these ‘natural’ curly hair products. Water, VP/VA Copolymer, Glycerin, Polyquaternium-7, Polysorbate 20, Triticum Aestivum (Wheat) Peptide, Avena Sativa (Oat) Peptide, Glycine Soja (Soybean) Peptide, Melissa Officinalis Extract, Humulus Lupulus (Hops) Extract, Cymbopogon Schoenanthus Extract, Chamomilla Recutita (Matricaria) Extract, Rosmarinus Officinalis (Rosemary) Extract, Achillea Millefolium Extract, Phenoxyethanol, Ethylhexylglycerin, Aminomethyl Propanol, Acrylates/C10-30 Alkyl Acrylate Crosspolymer, Fragrance. While most of the ingredients are fine in this gel of the 5 most abundant ingredients in this gel 3 are ingredients that are not good for you or the environment. VP/VA Copolymer also know as Vinyl Acetate is derived from petroleum. While there are not studies showing it poses a health risk to people it is made from a non-renewable resource and I like to avoid it. Polyquaternium-7- Has been tied to organ system toxicity. Polysorbate 20- Has been tied to organ system toxicity. Alright let’s go over a few of these ingredients. Fragrance- The reason this ranks a 10 on my ‘avoid at all cost’ scale is because companies can throw pretty much whatever they want in and call it fragrance. Under the Fair Packaging and Labeling Act companies do not have to disclose these ‘trade secret’ fragrance ingredients, even to the FDA. Ummm, yeah sure, that sounds reaaal safe. Aminomethyl Propanol-Irritation (skin, eye, and lungs). Possible ecotoxicology concerns. Ethylhexyl Methoxycinnamate- Enhanced skin absorption, Biochemical or cellular level changes, Endocrine disruption, Allergies/immunotoxicity, Persistence and bioaccumulation, Developmental/reproductive toxicity, Organ system toxicity. I don’t know about you, but I really don’t want to use all those icky chemicals on my hair. Of all the brands I have looked at and tried out Shea Moisture had the most natural ingredients but it didn’t work for my white girl curly hair, it was too heavy and left it greasy. If you have thick, coarse hair give the Shea Moisture products a try! I began experimenting a few years ago with products, like my DIY Flax Seed Gel, to use on my hair. While I love my gel and still use it often I sometimes find it a a bit heavy and want just a light frizz control hold. So back to the kitchen I went to try and whip up (literally) some mousse for my hair and after a bit of trial and error this is my new go to homemade hair mousse recipe! 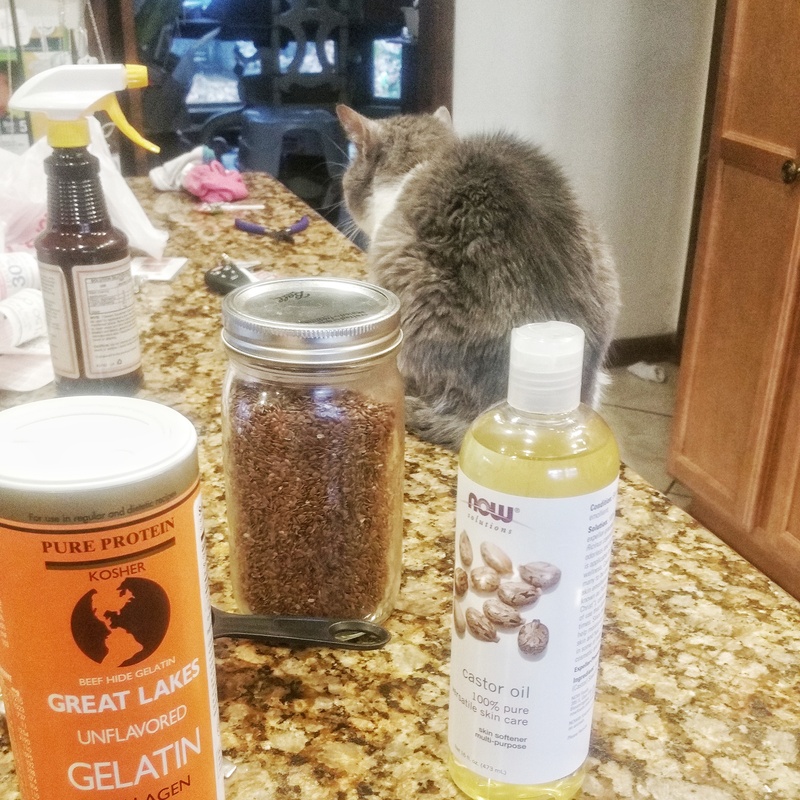 I had a great kitty helper while making my mousse! This recipe is a whipped variation of my Flax Seed Gel. Add the water to a saucepan and whisk in the gelatin. Add the flax seeds to water and gelatin and turn stove on medium until boiling. Boil 9-11 minutes until the liquid has gelled and hangs from a spoon. Add in castor oil and stir. Use a mesh strainer and separate the gelled liquid from the flax seeds. Allow the liquid to cool to room temperature then add in essential oils. Using a stand mixer or hand mixer beat the gelled liquid until it forms a light and fluffy mousse and store in the fridge. This mousse will not hold indefinitely, mine usually begins to break after 3 days. What I do is fill multiple containers with 3-4 days worth of mousse and freeze all of the ones I am not using. Then when I run out I just defrost a frozen one in the fridge and then use it. You can also re-whip the mousse or use it like gel if/when it breaks. ***Special Weather Statement*** Humidity and rain are not your friends when trying to whip this up, they kinda bog everything down and make the process much longer. *Use cold water or the gelatin will glomp together. **You may be able to sub the gelatin with Agar Agar, but I have not tried this personally. Ylang Ylang– Adds moisture and shine. Cedar Wood– Supports healthy hair growth. Sandalwood– Nourishes dry hair and supports healthy hair growth. Castor Oil– Helps hair grow faster, stronger, and thicker and helps condition your hair. This stuff has been seriously awesome for my hair! It nourishes it and helps keep it curly and frizz free the whole day. I took this picture at 9 0’clock at night after a long day chasing toddlers and taking care of my horse at the barn. 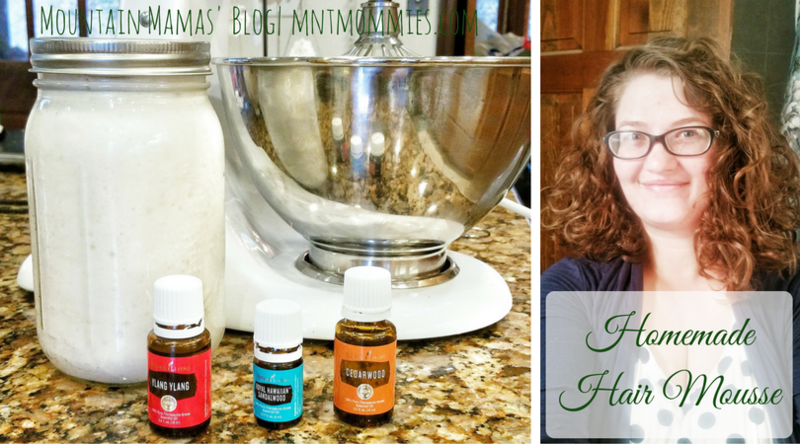 This entry was posted in DIY, Essential Oils, Hair. I wonder if one of those foam hand soap dispensers could be used instead of whipping it up? Possibly, I will get one and try it out! Thanks so much for the recipe. I will certainly give it a go. So, did the foam hand dispenser work? I have one of those plastic refillable mousse bottles. I’ll try that. Yes, but I had to dilute it. I made the gel and put in half gel and half water. So it is not as strong of a hold. You can also just use it as a gel without whipping but you have to put it in when your hair is soaking wet, the mousse is easier to spread through my hair than the gel I find. How about substituting a marshmallow root infusion in lieu of the gelatin? Thanks for the recipe. I’m super excited to try it out this weekend!